In Alchemy we focus our work on the seven planetary metals. 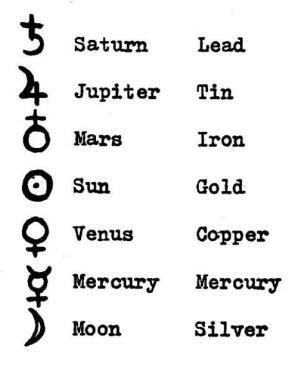 These Metals correspond to the Archetypes of the main Planetary Bodies in our Solar System. The Alchemists of old believed that in essence, these metals were the manifestation of the same archetype that dominates the planet associated with them. Alchemy has become buried in very much myth, and among the general populace the work with metals was seen to be merely done in an attempt to transmute a lesser metal into actual gold. But this was not the form of transmutation that alchemist concerns themselves with in reality. To the alchemist the art of transmutation was to transform an element from one kingdom into another. To transmute a metal into a mineral and from there into a plant life or even animal life. In the work of Metallic Alchemy. One of the Pathways to approach this is “the Acetate Path”. We must understand the Alchemists believed that every thing is composed of 3 elements. Sulfur,Mercury and Salt. In Plant Alchemy, The Sulfur is the Essential Oil of the Plant, Mercury the Alcohol obtained by fermentation of its Body, Salt the water-soluble salts obtained from the ashes of its body. What is fascinating, is that it is possible to obtain the sulfur of a metal, which is the essential oil of that metal. To do this, a metal is turned to an oxide and that is dissolved in the mercury of the metallic kingdom. This turns the metallic oxide into an acetate. If we refine and purify this acetate, we can then continue by dry distilling it, which will yield us the Sulfur of our Starting Metal and also a very special Mercury. This is a short intro into the Metallic work and I will journal my own experiments within this realm as time passes here on the website.